OMG what a day yesterday. I scored 2 tickets to the taping of part of the Glee Season Finale. I was on Twitter on Tuesday and saw a FOX TV tweet that said a limited # of seats were available, blah blah, email your info, go to Los Angeles to see the taping. So I thought what the heck (LA is 2 1/2 hours away from me) and low and behold I got in. I guess you had to have a speedy trigger finger because they posted it at Noon and by 12:05 it was auto-replying people the invite was closed. So yesterday I head up to LA. Got there at 11, saw the line was already 3 deep, grabbed coffee and stood till 2:30 when they let us in. It ended at around 11 PM. I got to be in the balcony as an audience member during Regionals (the season finale) I suppose there is the potential I could be flashed upon by a camera for a micro-nanosecond. The process from behind the scenes was so cool to watch. We couldn't take pictures, strict rules as to what can be brought on to the set. So no Puck, Eggface, Finn sandwich picture. Bummer, had to leave that for my daydreams. I am SWORN TO SECRECY at all the AWESOME cool things I got to see and HEAR. Let's just say if you were an 80's teen like me you will LOVE it. I got to meet the cast, they did Q&A's (loved them all but one), I got Jane Lynch's (Sue Sylvester's autograph) she's is the nicest lady. So be sure when you watch the finale you look in the middle of the first row of the balcony for yours truly. and I walked about 5 miles. Ahhhhhhhhhhhhh! Shelly you have the best life ever!!! I have been so compulsive about the Madonna episode the last few days, I can only imagine watching some of the action in person. How fun!!!! What a great thing...I have the Glee soundtracks (vol 1 & 2) on constant rotation in my vehicle and iPod. Being the consumate band geek/choir nerd in high school, the show brings back good memories. So glad you got to be a part of a pop culture phenomenon! That is so amazing!!! 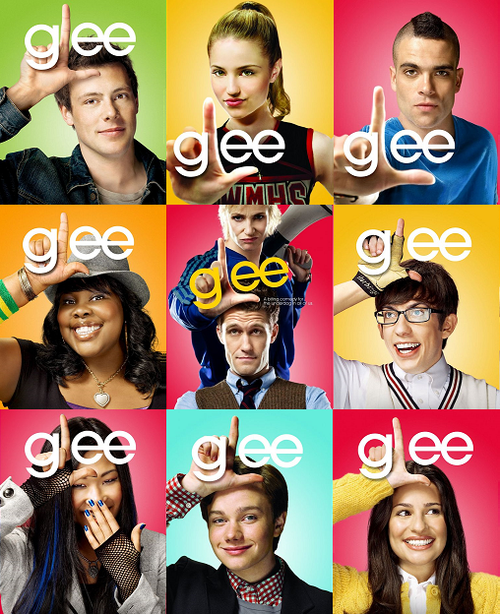 I love Glee!!! I just watched the most recent episode three times!!! Can't wait to see the finale. What a great experience you had! BTW, I know you like entering cooking contests. Today I saw Paula Dean on TV advertising for a contest by Philadelphia Cream Cheese and I think the grand prize is $25,000. Don't quote me on that, but I thought of you immediately, since you are such an awesome cook. You could probably Google it and find out about the contest. You Gleeking Gleeker you! I am more jealous than I can say, but very happy for you. I too am dying to know who you did NOT like in the Q&A. Inquiring minds want to know! Since that's a personal opinion, I don't think you'd get in trouble for that. I'll be watching avidly during the finale - as well as all season long! WWMD - priceless!! seeing myself in the audience of the Bonnie Hunt show was actually my "final straw" motivator to get lap band. Glad you had a good time!! I believe Glee airs opposite of Lost, so I won't be able to see Glee till Lost goes back into repeats. I haven't posted for months (although I read your stuff all the tiem) but damm girl, I am so jealous!! Very cool!! God, I hope it wasn't Mr. Shuster that you didn't like. Wow you are on a winning streak! Congratulations and what fun. What a great experience for you. Soak it up! !